art / culture / Out and About / sacramento / Shows / Things to do / Things to do Around Town. The image of office work is a mundane one: endless streams of emails, hokey team spirit exercises, mind-numbing meetings. 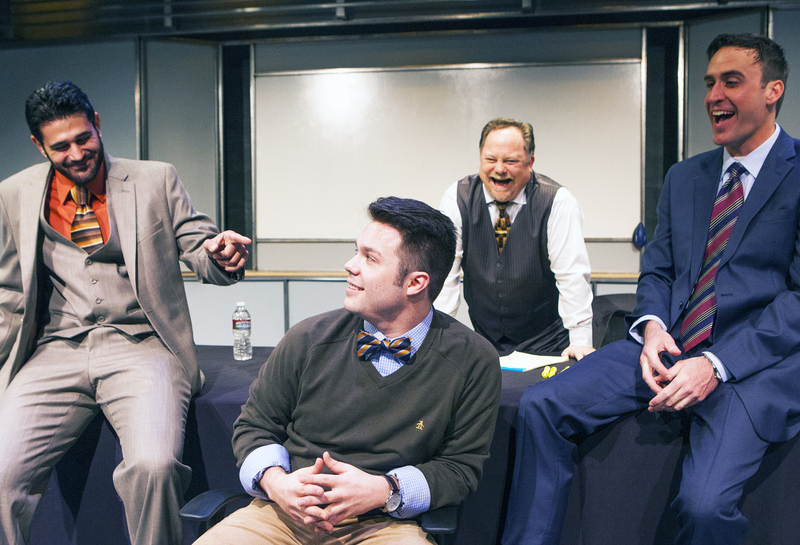 But Capital Stage’s new show, Ideation, is not your everyday office story. The show, which opened Jan. 24, centers on a small group of corporate consultants tasked with designing a mysterious project. They have had little time to prepare, and the audience joins the count down in real time as the team attempts to piece together a plan worth presenting to the CEO. But increasing paranoia is clouding their creativity. The set is a typical conference room: a few bottles of water, highlighters, pens and pads of paper make it seem like just another day in a corporate office. By the show’s finale, the room looks as though an office supplies bomb exploded – markers and memos strewn about – and nobody can be trusted. Several of the “suit” stereotypes are represented in the show. Hannah, the powerful businesswoman who oversees the project, tries to stay calm and collected as the hypothetical scenarios intensify. 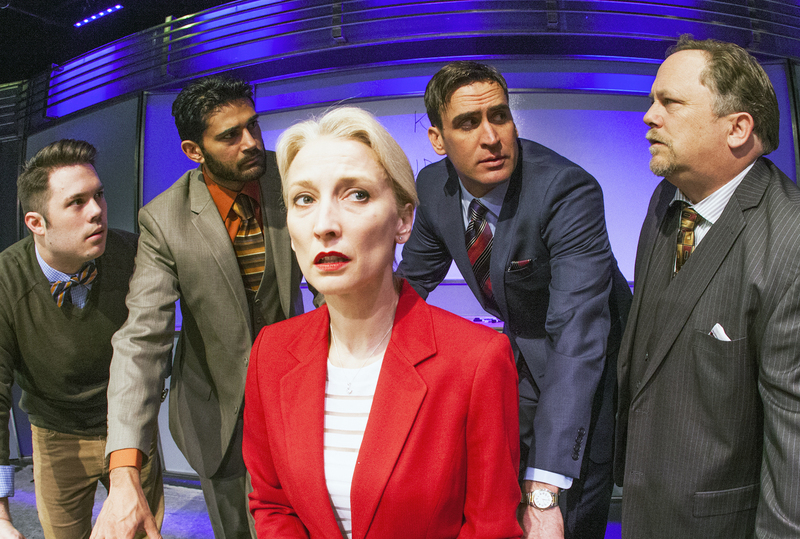 Carrie Paff is perfect as Hannah – serious about her corporate career but not completely drained of humanity. Paff originated this role in the 2013 San Francisco Playhouse world premiere. 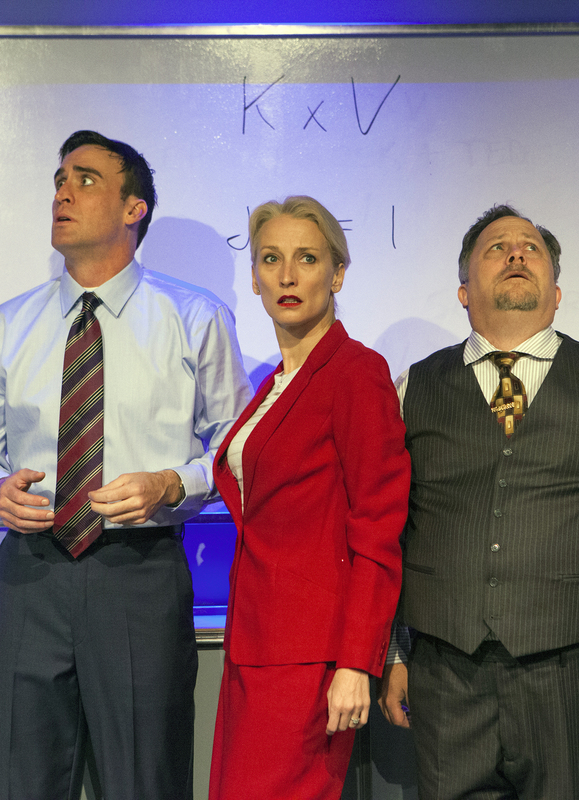 The show, written by Aaron Loeb, earned the 2014 Glickman Award Winner for Best New Play. Then there is the trio right off the plane from a business trip in Crete – although how much business was accomplished is not clear. The project leader is Brock – a fitting name for the well-dressed, all-American businessman who still has an air of college bachelorhood. Jason Kuykendall is hilarious as Brock, who is loud, a little mischievous, and whose emotions show in little bursts. His two sidekicks – Sandeep and Ted – round out the trio. 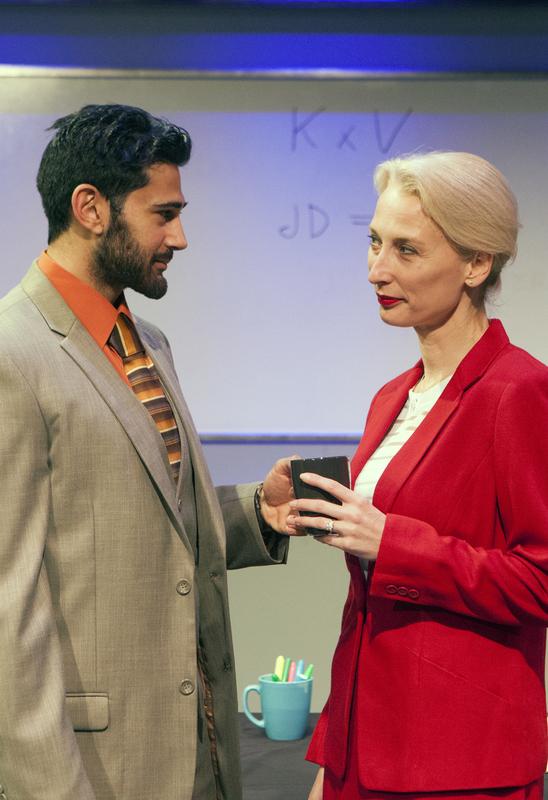 Sandeep, the young, sharp, and passionate immigrant Ph.D student is played by Jimmy Sidhu. Ted, the team’s “papa bear,” is played by Cap Stage’s co-founder and artistic associate Peter Mohrmann. Mohrmann is fitting as Ted, the loved but mocked middle-aged family man in the group. And though he tries, even he fails to keep his paranoia in check. And then there is Scooter, played by Russell Dow. Scooter is an assistant who is more useless than an intern, and who got the job through nepotism. Will the team find out whether their sinister suspicions are legitimate? Are they able to sift fact from fallacy, morality from dutiful loyalty, and figure out what the hell is going on? Only those who see it will get to find out. Shows run Wednesdays at 7 p.m., Thursdays through Saturdays at 8 p.m., with Saturday and Sunday matinees at 2 p.m. through Feb. 22. For tickets and more info visit capstage.org and check them out on Facebook. 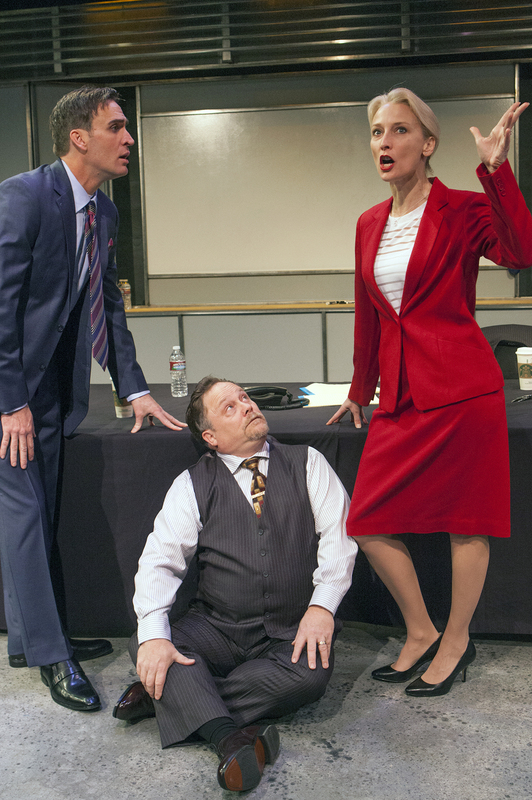 Tags: 2014 Glickman Award Winner for Best New Play, Aaron Loeb, Capital Stage, Carrie Paff, Charr Crail, comedy, Ideation, Jason Kuykendall, Jimmy Sidhu, Kate Gonzales, night out, office comedy, office drama, Peter Mohrmann, plays, Russell Dow, Sacramento, stage, theater, tube magazine. Bookmark the permalink. Previous post ← See: The Kelps and Sprïng.